Snrky: So they're formalizing your existing behavior? So they're formalizing your existing behavior? Your flip flops are smelling up the colocation space. (I think this would have been better). I'm not participating in tank top day, no matter what you say. Paired programming does not mean wearing matching Hawaiian shirts. Casual still means shirt and shoes. How did you know the new policy before it was announced? Fezzes are cool. (for geek cred - but I'd have had to put a fez on Poor Paired Cube Guy and there wasn't one on my contact sheet of props. That, and trying to draw a Tardis would have taken me at least an hour I should be spending on taxes). Alternates to that last one: bow ties are cool. Cowboy hats are cool. Turning your shirt inside out is not casual...not really. Snarky: They said we’re now casual all the time. I embrace it as more than a simple dress code. 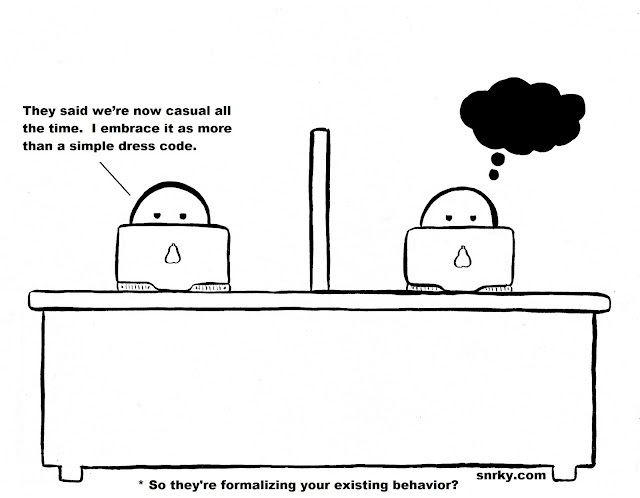 Title: So they're formalizing your existing behavior?